We are one week away from the Punknews Summer Soiree 2! As you may know by now, it's a KILLER dual headline show. Joe Jack Talcum of Dead Milkmen is doing a full band set backed by Dan Stevens (also of the Milkmen) and Woods! 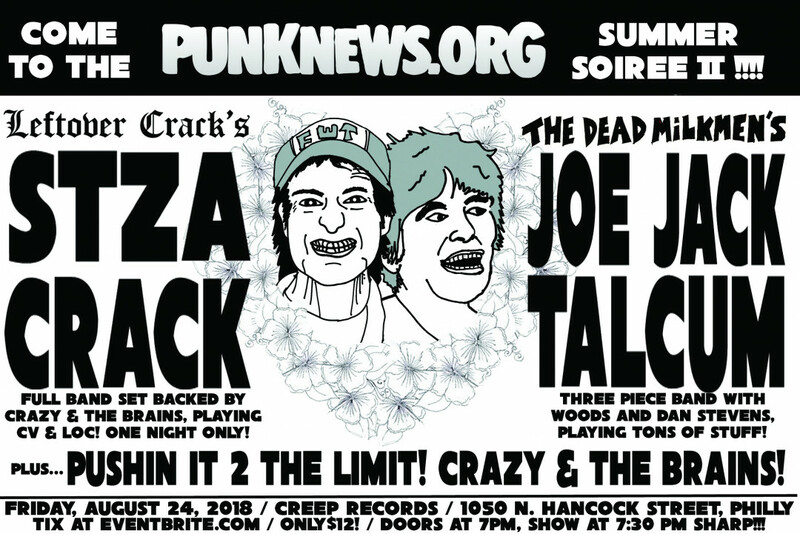 THEN, Stza Crack of Choking Victim and Leftover Crack is doing a full band set backed by Crazy and the Brains! Plus, CatB are doing a set of their own and Pushin it 2 the Limit opens the show! Plus, everyone that comes to the show gets a goodie bag with sweet treats from Fat Wreck Chords, Pirate's Press, Cinema Cinema, the Fullers, Coin Toss Records, and more! Plus, we are raffling off an original painting by Jesse Michaels and all money raised by that goes directly to St. Jude Children's Research Hospital! The event is August 24 at Creep Records in Philly. Doors are at 7pm and the show starts at 7:30pm SHARP. Don't be late,you won't want to miss a moment! Tickets might sell out before the event, so if you want to go, advance tix are highly recommended!